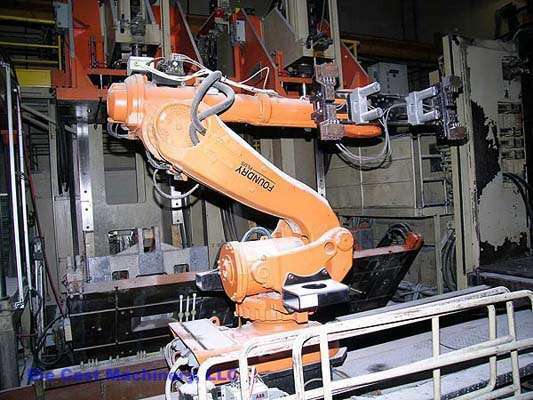 For Sale: One - Used - ABB/Rimrock IRB 6650 Foundry Robot DCM 1701. Inventory item: DCM-1701. One used (second hand) ABB/Rimrock, Model: IRB 6650, 7 Axis Long Slide Die Cast Industrial Extractor Robot (7th axis is 6 meter linear axis to approach and retract from die cast machine), Serial Number: 66-41292, New in: 2005 (installed January 2006). 8,195 "on-time" hours indicated. Cell Number: 13, DCM Inventory Number: 1701. Foundry applications.